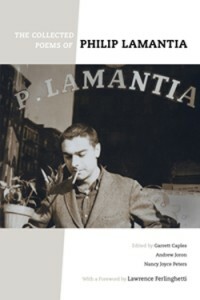 On Sunday, September 22, at 7 p.m. a celebration of the release of Philip Lamantia’s Collected Poems at Counterpath, with a reading and Q&A with volume editors Garrett Caples and Andrew Joron. Throughout his life, Lamantia sought to extend and renew the visionary tradition of Romanticism in a distinctly American vernacular, drawing on mystical lore and drug experience in the process. The Collected Poems gathers not only his published work but also an extensive selection of unpublished or uncollected work. Andrew Joron was raised in Stuttgart, Germany, Lowell, MA, and Missoula, MT. He studied under anarchist philosopher Paul Feyerabend at UC Berkeley, obtaining a BA in philosophy of science. Joron began writing science-fiction poetry before turning to surrealist-influenced lyric, reflecting his association with Philip Lamantia. His translations from German include philosopher Ernst Bloch’s Literary Essays. His recent books of poetry and essays include Trance Archive (City Lights) and The Cry at Zero (Counterpath). Garrett Caples is a poet who lives in Oakland, CA. He’s published two full-length collections, The Garrett Caples Reader (Black Square Editions, 1999) and Complications (Meritage Press, 2007). His latest chapbook is Avid Diva (Lew Gallery/Auguste). Besides poetry, he has written essays, reviews, fiction, interviews, and features for various publications, including Rain Taxi, The Brooklyn Rail, and Chicago Review. He’s also a contributing writer to the San Francisco Bay Guardian focusing on art, literature, and most frequently hip-hop. A member of the editorial board at City Lights Books, he curates the new American poetry series, City Lights Spotlight.